The present invention relates to a method, a device and an integrated circuit for improving picture sharpness. The method includes the following steps: (a)each pixel of the picture is respectively marked as edge/texture or non-edge/texture, (b)the pixels marked as edge/texture are classified into boundary-point-type, transition-point-type or peak-point-type; (c) the boundary-point-type pixels arefiltered by using a shrinking/extending filter, and then the peak-point-type pixels are filtered by using a high-frequency compensation filter, after that the transition-point-type pixels are filtered by the high-frequency compensation filter to sharp the picture. 本发明涉及一种改善图像锐度的方法、装置，及集成电路，特别是涉及一种可降低振影噪声（Ringing Noise)并改善图像锐度的方法、装置，及集成电路。 Method  The present invention relates to a method for improving image sharpness, apparatus, and an integrated circuit, particularly relates to a noise reducing vibration Movies (Ringing Noise), and improved image sharpness, apparatus, and an integrated circuit. 图像增强（Image Enhancement)常用于改善图像质量，而图像锐化（Image Sharpening)是达到图像增强的方法之一。  The image enhancement (Image Enhancement) commonly used to improve image quality, and image sharpening (Image Sharpening) is one way to achieve image enhancement. 一般来说，现有的图像锐化方法通常包含下列步骤。  In general, conventional image sharpening process generally comprises the following steps. 首先，检测出图像中的多个边缘画素（Edge Pixels)。 First, a plurality of detected edge pixels (Edge Pixels) image. 其次，通过更改这些边缘画素及其周边画素的灰阶强度(Gray-scale Intensity)，来达到增加图像锐度的效果。 Secondly, by changing the strength of the peripheral edge pixels and their gray scale of pixels (Gray-scale Intensity), to achieve the effect of increasing image sharpness. 此种方法，固然可以增加这些边缘画素及其周边画素的对比度（Contrast)，但是，常常会因过分更改这些边缘画素及其周边画素的灰阶强度，使得边缘画素及其周边画素的对比度过大而产生图像的截割（Clipping) 与振影，导致人眼容易察觉该图像有不自然的过度锐化（Over-sharpening)的现象。 This method, although these can increase the edge pixel and its surrounding pixels contrast (Contrast), however, often change these edge pixel and its surrounding pixel grayscale intensity due to too much, so that the edge pixel and its surrounding pixels is too much contrast generating an image of cutting (Clipping) and vibration film, leading to the human eye is easy to perceive the image unnatural excessive sharpening (Over-sharpening) phenomenon. 为了解决过度锐化的缺点，如美国专利公开案US20050135701中所揭示的，该专利所使用的方法包含以下步骤。  In order to solve the drawbacks of over-sharpening, as described in US Patent Publication US20050135701 disclosed in, using the method of this patent comprises the following steps. 首先，求得一组检测出的图像边缘（Detected Edge)。 First, obtain a set of edges of the image (Detected Edge) detected. 其次，由该组检测出的图像边缘决定一组示范边缘（Exemplary Edge)。 Secondly, it detected by the set of image edge determining a set of exemplary edge (Exemplary Edge). 再其次，根据该组示范边缘预测图像锐化的程度，求出过度锐化量测值（Average Normalized Overshoot Percentage,以下简称OS)。 Thirdly, according to the degree of the set of model predicted image sharpening edge, over-sharpening is obtained measured value (Average Normalized Overshoot Percentage, hereinafter referred to as OS). 最后，以该OS作为判断参数，如下所示，确定该图像进一步改善锐度的处理方式。 Finally, the OS is determined as a parameter, as shown below, the image is determined to further improve the sharpness processing mode. 其中如果该0S的值越大，表示该图像锐化的程度越高，像是OS ^ 35%，即代表该图像已过度锐化，需进行模糊化处理；依此类推，该0S的值越小，表示该图像锐化的程度越低或越模糊，像是0S < 15%，即代表该图像不够锐利，需进行完全锐化处理。  wherein if the value of the 0S is larger, the higher the degree of image sharpening, such as OS ^ 35%, which represents the image has been over-sharpening, blurring processing required; and so on, which 0S the smaller the value, the lower the degree of sharpening of the image is blurred or more, such as 0S <15%, which represents the image not sharp, the need for full sharpening process. 以该0S的值为该判断参数，可限制对该图像锐化的程度，解决过度锐化的缺点。  In the determination of the parameter value 0S, limit the degree of image sharpening, to address the shortcomings of the over-sharpening. 但是，这些图像边缘在经过上述的处理后，依然无法避免振影噪声的产生。 However, the edges of the image after the above processing, image still can not avoid vibration noise. 因此，该现有技术的方法显有可改进之处。 Thus, this prior art method there can be substantial improvement. 因此，本发明的目的是提供一种改善图像锐度方法。  Accordingly, an object of the present invention is to provide a method for improving image sharpness. 于是，本发明的改善图像锐度的方法包括下列步骤，(a)将该图像的每一画素分别标示为边缘/纹理（Edge/Texture)类或非边缘/纹理（NonEdge/Texture)类；(b)将每一标示为该边缘/纹理类的画素分类为边界（Border)点型、过渡（Transition)点型，或峰(Peak)点型；（c)利用收缩/扩展（Shrinking/Expanding)滤波器，对该边界点型的画素进行滤波，继而利用高频补偿（High Boost)滤波器，先对该峰点型的画素进行滤波，再对该过渡点型的画素进行滤波，以便锐化该图像。  Thus, the method of the present invention to improve image sharpness comprises the steps of, (A) each of pixels in the image are labeled as edge / texture (Edge / Texture) or non-edge / texture (NonEdge / Texture) class; (b) the classification of each pixel labeled as the edge / boundary of the texture class (border) point type, the transition (transition) point type, or peak (peak) point type; (c) using the contraction / expansion (shrinking / Expanding) filter, pixels of the border point type filter, then a high-frequency compensation (High Boost) filter, to filter the peak point type pixels, then filter the pixels of the transition point type, to sharpen the image. 本发明的另一个目的是提供一种改善图像锐度的装置。  Another object of the present invention is to provide an apparatus for improving image sharpness. 于是，本发明改善图像锐度的装置包括画素检测单元、画素类型判断单元，及滤波单元。  Thus, the apparatus of the present invention to improve image sharpness detecting means comprises a pixel, a pixel type determining unit, and a filter unit. 该画素检测单元用以将该图像的每一画素分别标示为边缘/纹理类或非边缘/纹理类；该画素类型判断单元用以将每一标示为该边缘/纹理类的画素分类为边界点型、过渡点型，或峰点型；该滤波单元包括收缩/扩展滤波器以及高频补偿滤波器。 The pixel detecting means for each of pixels in the image are labeled as an edge / texture type non-edge / texture type; the pixel type determining unit for each pixel will be labeled as the edge / texture type is classified as a boundary point type, type of transition point or peak point type; the filter unit comprises a contraction / expansion compensation filter and the high frequency filter. 该收缩/扩展滤波器用以对该边界点型的画素进行滤波，继而该高频补偿滤波器用以先对该峰点型的画素进行滤波，再对该过渡点型的画素进行滤波。 The shrinking / expanding filter for filtering the pixel type boundary point, then the high frequency compensation filter for filtering the first peak point type pixels, then filter the pixels of the transition point type. 本发明的再一个目的是提供一种改善图像锐度集成电路。  A further object of the present invention is to provide an integrated circuit for improving image sharpness. 于是，本发明改善图像锐度的集成电路包括画素检测单元、画素类型判断单元，及滤波单元。  Thus, an integrated circuit for improving image sharpness detecting means of the present invention includes a pixel, a pixel type determining unit, and a filter unit. 该画素检测单元用以将该图像的每一画素分别标示为边缘/纹理类或非边缘/ 纹理类；该画素类型判断单元用以将每一标示为该边缘/纹理类的画素分类为边界点型、 过渡点型，或峰点型；该滤波单元包括收缩/扩展滤波器以及高频补偿滤波器；该收缩/扩展滤波器用以对该边界点型的画素进行滤波，继而该高频补偿滤波器用以先对该峰点型的画素进行滤波，再对该过渡点型的画素进行滤波。 The pixel detecting means for each of pixels in the image are labeled as an edge / texture type non-edge / texture type; the pixel type determining unit for each pixel will be labeled as the edge / texture type is classified as a boundary point type, type of transition point or peak point type; the filter unit comprises a contraction / expansion compensation filter and the high frequency filter; the shrinking / expanding filter for filtering the pixel type boundary point, then the high-frequency compensation filter is used to filter the peak point type pixels, then filter the pixels of the transition point type. 本发明通过先将该图像的所有画素标示为边缘/纹理类或非边缘/纹理类；继而将该边缘/纹理类的画素再分类为该边界点型、过渡点型，或峰点型，并对相异点型的画素进行适合的滤波处理。  The present invention will first of all pixels in an image labeled as the edge / texture type non-edge / texture type; then the edge pixels / texture type of the border point and then the classification type transition point type, or peaks type, and the different point type for a suitable filtering process pixels. 经过上述处理后，不但可以改善图像锐度，还可以避免过度锐化及振影噪声产生，从而能够达到本发明的目的。 After the above process, not only can improve image sharpness, but also to avoid over-sharpening and noise vibration film, so as to achieve the object of the present invention. 图4是说明单边缘图样的处理前、经过本发明处理后，及经过现有技术方法处理后的比较结果示意图。  FIG. 4 is a diagram illustrating the front edge of the pattern processing unit, after the process of the present invention, and after the comparison result of the prior art method for processing. FIG. 有关本发明的前述及其它技术内容、特点与功效，在以下配合参考附图的优选实施例的详细说明中，将可进一步明确。  The foregoing and other related technical contents, characteristics and effects of the present invention, the following detailed description of preferred embodiments with reference to the accompanying drawings of the embodiments, will be further clarified. 参见图1、图2，和图3，本发明改善图像锐度的装置的优选实施例用以锐化图像， 并同时避免不自然的过度锐化及振影噪声产生，其中该图像包括多个画素。  Referring to FIGS. 1, 2, and 3, a preferred apparatus for improving image sharpness embodiment of the present invention to sharpen the image, while avoiding excessive sharpening unnatural noise and vibration Movies, wherein the image It includes a plurality of pixels. 6是分别对该图像的水平方向及垂直方向进行处理。 6 are processing the horizontal direction and the vertical direction of the image. 如图2所示，以下的步骤41至45，为对该图像的水平方向进行处理。  As shown in FIG 2, the steps 41 to 45 for processing the horizontal direction of the image. 继而定义水平分类旗#Px(i，j)代表（i，j)位置的画素的分类类别，如果该画素的水平梯度值Gx(i，j)的绝对值大于一个梯度临限值，则将该画素的水平分类旗标Px(i，j) 标示为该边缘/纹理类；否则，将该画素的水平分类旗标Px(i，j)标示为该非边缘/纹理类。  The pixels in turn define the horizontal classification flag #Px (i, j) representative of (i, j) position of the classification category, if the level of the absolute value of the gradient of the pixel values ​​of Gx (i, j) is greater than a gradient threshold value , then the pixel level classification flag Px (i, j) for marking the edge / texture type; otherwise, the pixel level classification flag Px (i, j) for marking the non-edge / texture type. 最后对于每一水平分类旗标Px(i，j)标示为该边缘/纹理类的画素，判断其左右相邻画素的水平分类旗标Px(i_l，j) &Px(i + l，j)是否皆标示为非边缘/纹理类，如果是， 则将该画素的水平分类旗标Px(i，j)更改标示为非边缘/纹理类。  Finally, for each level of classification flag Px (i, j) for the pixel marked edge / texture type, which determines the level of the left and right adjacent pixel classification flag Px (i_l, j) & Px (i + l, j) if both labeled non-edge / texture type, if so, the level of the pixel classification flag Px (i, j) marked change non-edge / texture type. 在步骤42中，利用该画素类型判断单元2将该边缘/纹理类的画素进一步分类为边界点型、峰点型，或过渡点型。  In step 42, using the pixel type determining unit 2 the edge / texture type is further classified as a boundary pixel point type, the peak point type, or transition point type. 为了使以下描述更为清楚，该边缘/纹理类的画素可以用图3中的三种图样(Pattern)表示，分别是双边缘(Double Edge)图样6、单边缘(Single Edge)图样7，及纹理图样8。 To make the following description clearer, the edge / texture type pixel pattern can be expressed in three (the Pattern) in FIG. 3, the edges are bis (Double Edge) pattern 6, a single edge (Single Edge) pattern 7, and 8 texture pattern. 其中每一图样的横轴为画素的位置，纵轴为画素的灰阶值。 Wherein the horizontal axis represents a position pattern of each pixel, and the vertical axis represents the pixel grayscale value. 处理前的画素的位置与灰阶值的相对关系如曲线61、71，及81所示。 The relative relationship between the position of the pixel with the grayscale value of the curve 61, 71 before treatment, and 81 shown in FIG. 继而该峰点型判断模块22对于每一水平分类旗标Px(i，j)标示为边缘/纹理类的画素，判断其水平梯度值Gx(i，j))与其右相邻画素的水平梯度值&(1+1，j)乘积是否小于0。  then the peak point type determining module 22, for each level of classification flag Px (i, j) pixel labeled as an edge / texture type, which determines a horizontal gradient value Gx (i, j)) and its right adjacent pixels the horizontal gradient value & (1 + 1, j) is smaller than 0 product. 如果是，则该画素即分类为该峰点型，即为如曲线61及81中的C型所示。 If so, the pixel being classified as the peak point type, that is, as shown by curve 61 and C-81. 最后该过渡点型判断模块23将这些标示为该边缘/纹理类的画素中尚未分类为该边界点型或峰点型的剩余画素，分类为该过渡点型，即为如曲线61或71中的B型或D型。  Finally, the transition point type determining module 23 such pixel being labeled as the edge / texture class not classified as the border point type or a type of peaks remaining pixels, classified as the transition point type, that is, the curve 61 or the 71 B or D form. 7 其中如果该画素的水平点型旗标Tx(i，j)为A型，则矩阵坐标（2，3)对应至该画素位置（i，j)；如果该画素的水平点型旗#Tx(i，j))为E型，则矩阵坐标（2，1)对应至该画素位置（i，j)。 7  wherein if the pixel horizontal point type flag Tx (i, j) is type A, the matrix coordinates (2,3) correspond to the pixel position (i, j); if the pixel's level point type flag #Tx (i, j)) for the E-type, the matrix coordinates (2,1) correspond to the pixel position (i, j). 一种系数设定方式可以为，b值为a值2倍，且c值为b值2倍。 Coefficients way of setting, a value twice the value of b, b and c is 2 times the value. 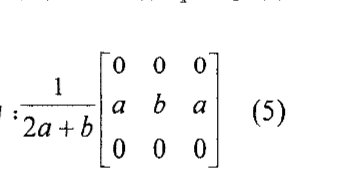 其中矩阵坐标（2，2)对应至该画素位置（i，j)。  wherein the matrix coordinates (2,2) correspond to the pixel position (i, j). 一种系数设定方式可以为，b值与a值正负号相反，且b值绝对值为a值绝对值之4倍。 Coefficients way of setting, and a value b value of opposite sign, and the absolute value b is a value four times the absolute value sum. 以下的步骤51至55，是对该图像的垂直方向进行处理，操作方式与该步骤41至45大致相同，只有计算的坐标方向有所不同，故接下来只就其不同之处说明。  The following steps 51 to 55, the process is performed in the vertical direction of the image, the operation steps 41 to 45 is substantially the same, only the calculation coordinate direction is different, so the following description only its differences . 表（i，j)位置的画素的分类类别，如果该画素的垂直梯度值Gy(i，j)的绝对值大于该梯度临限值，则将该画素的垂直分类旗标Py(i，j)标示为该边缘/纹理类，否则，将该画素的垂直分类旗标Py(i，j)标示为该非边缘/纹理类。 Pixel classification category table (i, j) position, if the vertical gradient of the pixel value of the absolute value Gy (i, j) is greater than the gradient threshold value, then the vertical pixel classification flag Py (i, j ) labeled as the edge / texture type, otherwise, the classification flag vertical pixels Py (i, j) for marking the non-edge / texture type. 最后对于每一垂直分类旗标Py(i，j)标示为边缘/纹理类的画素，判断其上下相邻画素的垂直分类旗标Py(i，j-1)及Py(i，j+1)是否皆标示为非边缘/纹理类，如果是，则将该画素的垂直分类旗标Py (i，j)更改标示为非边缘/纹理类。 Finally, for each vertical classification flag Py (i, j) pixel labeled as an edge / texture type, which determines the vertical pixel vertically adjacent classification flag Py (i, j-1) and Py (i, j + 1 ) is both labeled non-edge / texture type, if so, the vertical pixel classification flag Py (i, j) marked change non-edge / texture type. 继而该峰点型判断模块22对于每一垂直分类旗标Py(i，j)标示为边缘/纹理类的画素，判断其该垂直梯度值Gy(i，j)与其上相邻画素的垂直梯度值Gy(i，j+1)乘积是否小于0。  then the peak point type determining module 22, for each vertical classification flag Py (i, j) pixel labeled as an edge / texture type, which determines the vertical gradient value Gy (i, j) pixel adjacent thereto vertical gradient value Gy (i, j + 1) is smaller than 0 product. 如果是，则该画素即分类为该峰点型，即为如曲线61及81中所示的C型。 If so, the pixel being classified as the peak point type, that is, as shown by the curve 61 and C-81. 其中如果该画素的垂直点型旗标Ty(i，j)为A型，则矩阵坐标（3，2)对应至该画素位置（i，j)；如果该画素的垂直点型旗标Ty(i，j)为E型，则矩阵坐标（1，2)对应至该画素位置（i，j)。  wherein if the pixel's vertical point type flag Ty (i, j) is type A, the matrix coordinates (3,2) correspond to the pixel position (i, j); If the vertical pixel point type flag standard Ty (i, j) is the E-type, the matrix coordinates (1,2) correspond to the pixel position (i, j). 一种系数设定方式可以为，b值为a值2倍，且c值为b值2倍。 Coefficients way of setting, a value twice the value of b, b and c is 2 times the value. 其中矩阵坐标（2，2)对应至该画素位置（i，j)。  wherein the matrix coordinates (2,2) correspond to the pixel position (i, j). a值正负号相反，且b值绝对值为a值绝对值之4倍。 a value opposite sign, and the absolute value b is a value four times the absolute value sum. 经过步骤41至45，及步骤51至55之后，每一方向皆可得到分别如图3的曲线62、 72，及82所示的结果。  through steps 41-45 and then steps 51-55, each direction Jieke obtained, and as a result 72 shown in FIG. 3 curve 82 of FIG. 62, respectively. 此外，本发明改善图像锐度的集成电路包含图1中的该画素检测单元1、画素类型判断单元2，及滤波单元3。  In addition, the integrated circuit for improving image sharpness detector of the present invention including the unit pixel in FIG. 11, the pixel type determining unit 2 and filter unit 3. 参阅图1、图2，与图4，以单边缘图样说明本发明的技术与现有技术结果的差异。 1, 2, and 4, a single pattern edge difference technique described prior art and the present invention results  See FIG. 曲线91为处理前的位置与灰阶值相对关系，曲线92为经过本发明技术处理后的位置与灰阶值相对关系，曲线93为经过现有技术（如美国专利公开案US20050135701)处理后的位置与灰阶值的相对关系。 Curve 91 is a position before the processing corresponding relationship between the grayscale values, the curve 92 for the technical processing of the present invention after the position of the gray scale value corresponding relationship curve 93 (as described in US Patent Publication US20050135701) after processing pass prior art the relative relationship between the position and gray value. 比较曲线92与93，经过本发明与现有技术处理后，皆可达到增加锐度的效果；其差异在于：现有技术处理后会产生如曲线93中所示的振影噪声931。 Comparison of curves 92 and 93, after the present invention and the prior art process, can increase the effect of sharpness; The difference is that: after the prior art image processing generates vibration noise 93 as shown in graph 931. 综上所述，本发明改善图像锐度的方法、装置，及集成电路具有以下优点：首先，该非边缘/纹理类的画素在处理开始时，就被标示并排除进行后续的滤波处理，故该非边缘/ 纹理类的画素不会被不当地锐化。  In summary, the method of the present invention to improve image sharpness, apparatus, and an integrated circuit has the following advantages: First, the non-edge / texture type of process is started at the pixels, it can be marked excluded and subsequent filtering processing, so the non-edge / texture type would not be sharpened unduly pixels. 其次，通过该收缩/扩展滤波器以增强该图像中的边缘部分，且避免过度锐化与振影噪声产生。 Secondly, the shrinking / expanding filter to enhance an edge portion of the image, and to avoid over-sharpening and the oscillator Movies noise. 再者，通过该高频补偿滤波器以增加该图像中纹理部分的对比。 Further, by the high frequency compensation filter to increase the contrast of the image portion of the texture. 因此，的确能达成本发明的目的。 Thus, indeed achieve the object of the present invention. 以上所说明的仅是本发明的优选实施例，而不能以此限定本发明实施的范围，本领域技术人员在不脱离所附权利要求所限定的精神和范围的情况下对本发明内容所作的简单的等效变化与修饰，皆属于本发明涵盖的范围。 SUMMARY Under the present invention  The above-described embodiments are merely preferred embodiments of the present invention, but not limit the scope of this embodiment of the present invention, those skilled in the art without departing from the appended claims as defined by the spirit and scope of the case simple modifications and equivalent made, are encompassed within the scope of the present invention. 一种改善图像锐度的方法，其中如果是对该图像的水平方向执行所述方法，则包括下列步骤：(a)将该图像的每一画素分别标示为边缘/纹理类或非边缘/纹理类，包括子步骤：(a‑1)根据每一画素的灰阶值求出每一画素的水平梯度值，(a‑2)如果该画素的水平梯度值的绝对值大于一个梯度临限值，则将该画素标示为该边缘/纹理类，否则，将该画素标示为该非边缘/纹理类，及(a‑3)判断每一标示为边缘/纹理类的画素的左右相邻画素是否皆标示为非边缘/纹理类，如果是，则将该画素更改标示为非边缘/纹理类；(b)将每一标示为该边缘/纹理类的画素分类为边界点型、过渡点型，或峰点型，包括子步骤：(b‑1)判断每一标示为边缘/纹理类的画素的左右相邻画素其中的任何一个是否标示为非边缘/纹理类，如果是，则该标示为边缘/纹理类的画素即分类为该边界点型 A method of improving image sharpness, wherein the method is performed if the horizontal direction of the image, comprising the steps of: (a) each of pixels in the image are labeled as an edge / texture type non-edge / texture type, comprising sub-steps: (a-1) according to the gray level value of each pixel of the determined value of each pixel of the gradient, (a-2) if the absolute value of the horizontal gradient pixel values ​​is greater than a gradient threshold value , the pixel is labeled as the edge / texture type, otherwise, the non-edge pixel being labeled as the / texture type, and (a-3) is determined for each pixel of the marked around the edge / texture class if the adjacent pixels both labeled non-edge / texture type, if yes, the non-edge pixel being relabeled / texture type; (b) each pixel labeled as the edge / texture type classification type boundary point, transition point type, or peak point type, comprising sub-steps of: (b-1) is determined for each marked pixels around an edge / texture type adjacent an edge if any of the non-labeled / texture type wherein the pixel, and if so, the labeled edge / texture type pixel classified as the border point type (b‑2)判断每一标示为边缘/纹理类的画素的水平梯度值与其右相邻画素的水平梯度值乘积是否小于0，如果是，则该标示为边缘/纹理类的画素即分类为该峰点型；及(b‑3)将该标示为该边缘/纹理类的画素中尚未分类为该边界点型或峰点型的剩余画素分类为该过渡点型；及(c)利用收缩/扩展滤波器，对该边界点型的画素进行滤波，继而利用高频补偿滤波器，先对该峰点型的画素进行滤波，再对该过渡点型的画素进行滤波，以便锐利化该图像，其中如果是对该图像的垂直方向执行所述方法，则包括下列步骤：(a)将该图像的每一画素分别标示为边缘/纹理类或非边缘/纹理类，包括子步骤：(a‑1)根据每一画素的灰阶值求出每一画素的垂直梯度值， (a‑2)如果该画素的垂直梯度值的绝对值大于梯度临限值，则将该画素标示为该边缘/纹理类，否则，将该画素标示 (B-2) is determined for each pixel labeled as an edge / texture type horizontal gradient value and its right adjacent pixel is a product of the horizontal gradient value is less than 0. If yes, then the marked edge / texture type pixel that is classified as the peak point type; and (b-3) for the classification for the pixels not yet labeled edges / border point texture class type or residual type pixel peaks for the free transition point type; and (c) use of shrinkage / expanding filter, the filter type pixels border point, and then using a high frequency compensation filter, to filter the peak point type pixels, then filter the pixels of the transition point type, so that the image sharpening wherein the method is performed if the vertical direction of the image, comprising the steps of: (a) each of pixels in the image are labeled as an edge / texture type non-edge / texture type, comprising the sub-steps of: (a -1) is obtained for each vertical gradient value for each pixel according to the gray level value of the pixel, (a-2) if the absolute value of the vertical gradient pixel values ​​is greater than a gradient threshold value, then the edge pixel being labeled as the / texture class, otherwise, the pixel marked 该非边缘/纹理类，及(a‑3)判断每一标示为边缘/纹理类的画素的上下相邻画素是否皆标示为非边缘/纹理类，如果是，则将该画素更改标示为非边缘/纹理类；(b)将每一标示为该边缘/纹理类的画素分类为边界点型、过渡点型，或峰点型，包括子步骤：(b‑1)判断每一标示为边缘/纹理类的画素的上下相邻画素其中的任何一个是否标示为非边缘/纹理类，如果是，则该标示为边缘/纹理类的画素即分类为该边界点型；(b‑2)判断每一标示为边缘/纹理类的画素的垂直梯度值与其上相邻画素的垂直梯度值乘积是否小于0，如果是，则该标示为边缘/纹理类的画素即分类为该峰点型，及(b‑3)将该标示为该边缘/纹理类的画素中尚未分类为该边界点型或峰点型的剩余画素分类为该过渡点型；以及(c)利用收缩/扩展滤波器，对该边界点型的画素进行滤波，继而利用高频补偿 The non-edge / texture type, and (a-3) is determined for each marked pixel of the vertical edge / texture class if the adjacent pixels are labeled non-edge / texture type, if yes, the non-pixel relabeled edge / texture type; (b) the classification of each pixel labeled as the edge / texture type boundary point type, type of transition point or peak point type, comprising sub-steps of: (b-1) determined for each labeled as an edge / textured pixel vertically adjacent pixels of the class in which whether any labeled non-edge / texture type, if yes, the pixel labeled as an edge / texture type classified as the border point type; (b-2) Analyzing vertical gradient value of each pixel marked as a vertical gradient pixel values ​​of the edge / texture type product adjacent thereto is smaller than 0. If yes, then the marked edge / texture type pixel being classified as the peak point type, and (b-3) indicated that the remaining pixel border point type or a peak point type free edge pixels for the transition point type / texture type that has not been classified; and (c) using the shrinking / expanding filter, for the pixel boundary point type filter, then a high-frequency compensation 滤波器，先对该峰点型的画素进行滤波，再对该过渡点型的画素进行滤波，以便锐利化该图像。 Filter, to be the peak point type pixel filter, then filter the pixels of the transition point type, so that the image sharpening. 2. 一种改善图像锐度的装置，包括：画素检测单元，用以将该图像的每一画素分别标示为边缘/纹理类或非边缘/纹理类；画素类型判断单元，用以将每一标示为该边缘/纹理类的画素分类为边界点型、过渡点型，或峰点型；及滤波单元，包括收缩/扩展滤波器以及高频补偿滤波器，该收缩/扩展滤波器用以对该边界点型的画素进行滤波，继而该高频补偿滤波器用以先对该峰点型的画素进行滤波，再对该过渡点型的画素进行滤波，其中可分别对该图像的水平方向与垂直方向进行处理，其中如果是对该图像的水平方向处理，则该画素检测单元用以先根据每一画素的灰阶值求出每一画素的水平梯度值，如果该画素的水平梯度值的绝对值大于梯度临限值，则将该画素标示为该边缘/纹理类，否则，将该画素标示为该非边缘/纹理类，该画素检测单元继而用以判断每 An improved image sharpness apparatus, comprising: pixel detecting means for each of pixels in the image are labeled as an edge / texture type non-edge / texture type; pixel type determining means for each of the edge pixel being labeled as the classification / texture type boundary point type, type of transition point or peak point type; and filtering unit, comprising a contraction / expansion compensation filter and a high frequency filter, the contraction / expansion for the filter boundary point type filter pixels, then the first high-frequency compensation filter for filtering the peak point type pixels, then filter the type of transition point pixels, in which each of the horizontal direction of the image to the vertical direction processing, is a process wherein if the horizontal direction of the image, the gray level value of each pixel according to the determined value of each pixel of the horizontal gradient, means for detecting the absolute value of the first pixel if the pixel value of the horizontal gradient of greater than a gradient threshold value, the pixel is labeled as the edge / texture type, otherwise, the non-edge pixel being labeled as the / texture type, then the pixel detecting means for determining whether each 一标示为边缘/纹理类的画素的左右相邻画素是否皆标示为非边缘/纹理类，如果是，则将该画素更改标示为非边缘/纹理类，其中如果是对该图像的水平方向处理，则该画素类型判断单元包括： 边界点型判断模块，用以判断每一标示为边缘/纹理类的画素的左右相邻画素其中的任何一个是否标示为非边缘/纹理类，若是，则该标示为边缘/纹理类之画素即分类为该边界点型；一峰点型判断模块，用以判断每一标示为边缘/纹理类之画素的一水平梯度值与其右相邻画素之水平梯度值乘积是否小于0，若是，则该标示为边缘/纹理类的画素即分类为该峰点型；及过渡点型判断模块，用以将该标示为该边缘/纹理类画素中尚未分类为该边界点型或峰点型剩余画素分类为该过渡点型，其中如果是对该图像的垂直方向处理，则该画素检测单元用以先根据每一画素的灰阶 About a marked edge pixels / pixel texture class if both labeled adjacent non-edge / texture type, if yes, the non-edge pixel being relabeled / texture type, is a process wherein if the horizontal direction of the image , the pixel type determining means comprises: boundary point type determining module, for determining whether each of pixels labeled as left and right edge / texture type adjacent an edge if any of the non-labeled / texture type wherein the pixel, and if so, the labeled as the edge / texture type of pixels classified as the border point type; a peak point type determining module, for determining whether each pixel marked as a horizontal edge / texture type of the horizontal gradient value and its right adjacent pixel value of a product of the gradient is smaller than 0, and if yes, the marked edge / texture type pixel being classified as the peak point type; and a transition point type determining module, configured for the mark edge / texture type pixel not classified in the border point type or a peak point type for the remaining pixels classified transition point type, wherein if the image processing in the vertical direction, the detection pixel unit for each pixel in the gray scale according to 求出每一画素的垂直梯度值，如果该画素的垂直梯度值的绝对值大于一个梯度临限值， 则将该画素标示为该边缘/纹理类，否则，将该画素标示为该非边缘/纹理类，该画素检测单元继而用以判断每一标示为边缘/纹理类的画素的上下相邻画素是否皆标示为非边缘/ 纹理类，如果是，则将该画素更改标示为非边缘/纹理类，其中如果是对该图像的垂直方向处理，则该画素类型判断单元包括： 边界点型判断模块，用以判断每一标示为边缘/纹理类的画素的上下相邻画素其中的任何一个是否标示为非边缘/纹理类，如果是，则该标示为边缘/纹理类的画素即分类为该边界点型；峰点型判断模块，用以判断每一标示为边缘/纹理类的画素的垂直梯度值与其上相邻画素的垂直梯度值乘积是否小于0，如果是，则该标示为边缘/纹理类的画素即分类为该峰占型.及过渡点型 Vertical gradient value for each pixel is determined, and if the absolute value of the vertical gradient of the pixel is greater than a gradient threshold value, the pixel is labeled as the edge / texture type, otherwise, the non-edge pixel being labeled as the / texture type, then the pixel detecting means for determining whether each of the pixels marked as the vertical edge / texture class if the adjacent pixels are labeled non-edge / texture type, if yes, the non-edge pixel being relabeled / texture type, wherein if the processing is the vertical direction of the image, the pixel type determining means comprises: boundary point type determining module, for determining whether each of pixels labeled as the vertical edge / texture type pixel adjacent to whether any one of them labeled non-edge / texture type, if yes, the pixel labeled as an edge / texture type classified as the border point type; peak point type determining module, for determining whether each of pixels labeled as a vertical edge / texture type the product of the vertical gradient pixel values ​​adjacent thereto gradient value is less than 0. If yes, then the marked edge / texture type representing the pixel being classified as the peak type. transition point type and 判断模块，用以将该标示为该边缘/纹理类的画素中尚未分类为该边界点型或峰点型的剩余画素分类为该过渡点型。 A determining module for the edge pixels / texture type that has not been classified transition point type boundary point type or residual type pixels classified as the peaks for the labeling. 3. 一种改善图像锐度的集成电路，包括：画素检测单元，用以将该图像的每一画素分别标示为边缘/纹理类或非边缘/纹理类；画素类型判断单元，用以将每一标示为该边缘/纹理类的画素分类为边界点型、过渡点型，或峰点型；及滤波单元，包括收缩/扩展滤波器以及高频补偿滤波器，该收缩/扩展滤波器用以对该边界点型的画素进行滤波，继而该高频补偿滤波器用以先对该峰点型的画素进行滤波，再对该过渡点型的画素进行滤波，其中可分别对该图像的水平方向与垂直方向进行处理，其中如果是对该图像的水平方向处理，则该画素检测单元用以先根据每一画素的灰阶值求出每一画素的水平梯度值，如果该画素的水平梯度值的绝对值大于一个梯度临限值， 则将该画素标示为该边缘/纹理类，否则，将该画素标示为该非边缘/纹理类，该画素检测单元继而 An integrated circuit for improving image sharpness, comprising: pixel detecting means for each of pixels in the image are labeled as an edge / texture type non-edge / texture type; pixel type determining means for each and filtering unit configured to, including contraction / expansion compensation filter and a high frequency filter, the shrinking / expanding filter; a pixel labeled as the edge / texture type is classified as a border point type, type of transition point or peak point type the boundary point type filter pixels, then the first high-frequency compensation filter for filtering the peak point type pixels, then filter the type of transition point pixels, in which each of the horizontal and vertical direction of the image the direction of processing, is a process wherein if the horizontal direction of the image, means for detecting the first pixel value of each pixel according to the gray level gradient value of each pixel is determined, and if the horizontal gradient pixel values ​​of the absolute gradient value is greater than a threshold value, the pixel is labeled as the edge / texture type, otherwise, the non-edge pixel being labeled as the / texture type, then the pixel detecting means 以判断每一标示为边缘/纹理类的画素的左右相邻画素是否皆标示为非边缘/ 纹理类，如果是，则将该画素更改标示为非边缘/纹理类，其中如果是对该图像的水平方向处理，则该画素类型判断单元包括： 边界点型判断模块，用以判断每一标示为边缘/纹理类的画素的左右相邻画素其中的任何一个是否标示为非边缘/纹理类，如果是，则该标示为边缘/纹理类的画素即分类为该边界点型；峰点型判断模块，用以判断每一标示为边缘/纹理类的画素的水平梯度值与其右相邻画素的水平梯度值乘积是否小于0，如果是，则该标示为边缘/纹理类的画素即分类为该峰占型.及过渡点型判断模块，用以将该标示为该边缘/纹理类的画素中尚未分类为该边界点型或峰点型的剩余画素分类为该过渡点型；其中如果为对该图像的垂直方向处理，则该画素检测单元用以先根据每 To determine whether each of pixels labeled as left and right edge / texture type whether adjacent pixels are labeled non-edge / texture type, if yes, the non-edge pixel being relabeled / texture type, wherein if the image is horizontal processing, the pixel type determining means comprises: boundary point type determining module, for determining whether each of pixels labeled as left and right edge / texture type adjacent an edge if any of the non-labeled / texture type pixels wherein, if is labeled as the edge / texture type pixel classified as the border point type; peak point type determining module, for determining whether the value of the horizontal gradient of each pixel marked as an edge / texture type right horizontal pixel adjacent thereto gradient value is less than the product of 0, if yes, the marked edge / texture type representing the pixel being classified as the peak type. and transition point type determining module, configured to mark the pixels as the edge / texture class Not type classified as the border points or peaks remaining pixels classified as the type of transition point type; wherein the process if the vertical direction of the image, the pixel according to each detection unit is used to 画素的灰阶值求出每一画素的垂直梯度值，如果该画素的垂直梯度值的绝对值大于一个梯度临限值， 则将该画素标示为该边缘/纹理类，否则，将该画素标示为该非边缘/纹理类，该画素检测单元继而用以判断每一标示为边缘/纹理类的画素的上下相邻画素是否皆标示为非边缘/ 纹理类，如果是，则将该画素更改标示为非边缘/纹理类，其中如果是对该图像的垂直方向处理，则该画素类型判断单元包括： 边界点型判断模块，用以判断每一标示为边缘/纹理类的画素的上下相邻画素其中的任何一个是否标示为非边缘/纹理类，如果是，则该标示为边缘/纹理类的画素即分类为该边界点型；峰点型判断模块，用以判断每一标示为边缘/纹理类的画素的垂直梯度值与其上相邻画素的垂直梯度值乘积是否小于0，如果是，则该标示为边缘/纹理类的画素即分类为该峰占 Pixel gray level value is determined for each pixel of the vertical gradient value, if the absolute value of the vertical gradient of the pixel is greater than a gradient threshold value, the pixel is labeled as the edge / texture type, otherwise, the pixel marked for the non-edge / texture type, the pixel detecting means in turn used to determine whether each pixel are labeled labeled non-edge / texture type vertical pixels as an edge / texture type adjacent, if so, the pixel being relabeled non-edge / texture type, wherein if the vertical direction of the image processing, the pixel type determining means comprises: boundary point type determining module, for determining whether each pixel is labeled adjacent to the vertical edge pixels / texture type wherein if any marked non-edge / texture type, if yes, the pixel labeled as an edge / texture type classified as the border point type; peak point type determining module, for determining whether each labeled as the edge / texture vertical gradient pixel values ​​of the product class adjacent thereto a vertical gradient pixel values ​​is less than 0. If yes, then the marked edge / texture type pixel being classified as the peak representing .及过渡点型判断模块，用以将该标示为该边缘/纹理类的画素中尚未分类为该边界点型或峰点型剩余画素分类为该过渡点型。 . And a transition point type determining module, configured to mark the pixels as the edge / texture class not classified classified as the border point type or the remaining pixels for the peak point type transition point type.